Let's play a game: knowing nothing about this character, try to guess what year he was originally released. He's got some pretty wild colors, so he has to have come from the end of the line. I'm going to guess... 1993? When Cobra Commander found he could no longer trust the ninjas of the Arashikage Clan, he contracted a syndicate of high-tech ninjas led by the Night Creeper Leader. His disciples handle high-risk field intelligence operations and covert infiltration for the Cobra organization. He teaches his followers to strip away all scruples, morals, and innate feelings of common decency before going into battle. By using the most advanced stealth and anti-detection technology available, they strike their targets with deadly accuracy to retrieve their mission objective. Night Creeper Leader uses his lethal skills as a master martial artist to make sure all investigations into his origin and the structure of his Night Creepers lead into dead ends, and all investigators mysteriously disappear. Even his loyalty to Cobra most likely only lasts as long as they pay him. All that is known for certain is that their balance of ferocious martial arts skills and unexpectedly advanced technology make for a perfect Yin and Yang of doom. 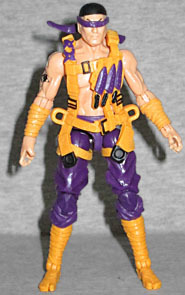 Turns out I was close: the Night Creeper Leader was indeed introduced in 1993, but that figure was orange and black - this purple and yellow colorscheme is based on the repaint from 1994. Why did the Club choose that color for their figure? Good question. Fittingly, the NCL is made entirely from reused ninja pieces: the arms and legs come from Ultimate Storm Shadow, the bare, scarred chest comes from RoC Arctic Storm Shadow, and although the webgear was first seen on Snake-Eyes, it was designed for an unreleased Storm Shadow. It's a nice choice for inclusion here, because the original wore a harness with a tanto dagger, two grenades and a shuriken on it - this one has three knives and two shuriken, but the idea is the same. 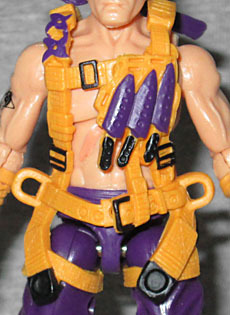 One new feature of this figure that no version of the character has ever had before is the tattoo on his right arm. This adds one more to the ranks of alternate Cobra logos - the outside is a four-pointed star, with a Cobra logo inside that, and a ☯ taijitu in the center. A nice little bit of design, that. We take back what we said earlier: there is one piece of the sculpt not taken from Storm Shadow - the head. It's tough to recognize, because we haven't seen it since 2009, but it's bald and scowling, and that tells us this was originally Serpentor! His skull cap is painted on, and he's wearing the skinny blindfold from Jinx over his eyes. 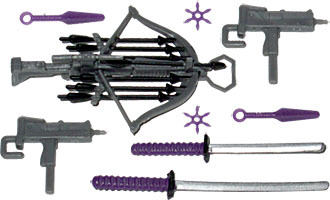 In addition to the aforementioned webgear, Night Creeper Leader comes with two swords, two throwing stars, and two kunai knives - those are all done in purple, though the swords at least have black handguards and silver blades. There are two grey MAC-10s, to hang off his belt, and the fancy crossbow the previous Night-Creepers have had. Since the '93/'94 NCL figure inexplicably came with some of Road Pig's weapons, this would have been a nice opportunity to release the wrist-mounted crossbow that was cut for budgetary reasons. When it comes to people leading the Night Creepers, I care more about Aleph than the Night Creeper Leader, but then, I'd also like to get an entire set of The Plague, and they're just black repaints. This is a very good modernization of an old design, but the design wasn't very good to begin with. As long as they were sticking with the original colors (whether they were orange and black or purple and gold), there was only so much that could be done to make this guy cool.